ALIBABA founder Jack Ma brought up the concept of New Retail at the 7th Alibaba Computing Conference 2016. New Retail aims to merge online and offline retail, and use adequate information and Big Data technology to enhance customers’ shopping experience. New Retail – backed by technology and Big Data – is changing China, and also the world. When the iPhone 7 was released in 2016, Apple partnered with Tmall.com to sell it online. Alibaba helped Apple promote it ahead of the release by using Big Data technology to target those already using high-end mobile phone brands. About 2 million people placed orders and 74% of them were from the targeted groups. Big Data technology should be used for a 360-degree collection and analysis of customers’ data. All those fragmentary pieces of information can be put together to solve the puzzle and present retailers with a clearer customer profile. JD, one of the major e-commerce websites in China, announced last year that it would invest 30 billion yuan (US$4.5 billion) to build an AI center in the small Guangdong town of Fenggang to better develop its AI technology for business, and that was just the tip of the iceberg. AI processes data in a more human and comprehensive way, which makes it a better option to handle large amount of data. AI is also used for customer services. On Double Eleven (Singles Day) day in 2016, Ali Xiaomi – the AI customer service system developed by Alibaba – served 6.32 million customers, which equals the number of customers served in 24 hours by 52,000 real people without a break. Augmented Reality (AR) is changing the world and e-commerce landscapes. Online retailers can use AR to supplement shopping experiences by letting customers have a virtual try on. Tmall once used AR to encourage customers to participate in the game “Catch the Cat” to win coupons. Previous experience with Alipay and its AR red pockets campaign in 2017 also told us that customers are more willing to engage in entertaining and interactive campaigns especially given some rewards. AR is a lens, through which users can see a different world that is alive and vivid. With AR, New Retail’s core concept of integrating online and offline retail can be realized. Amazon has opened its self-service unmanned supermarket Amazon Go, which implemented advanced IT. The world may reach an agreement that data technology is forcing retail, no matter online or offline, to make a transition. Purely online or offline may be outdated in the future and those e-commerce big names – by making the best of data and technology – are invading the field they weren’t expected to enter before… in China, and the rest of the world. 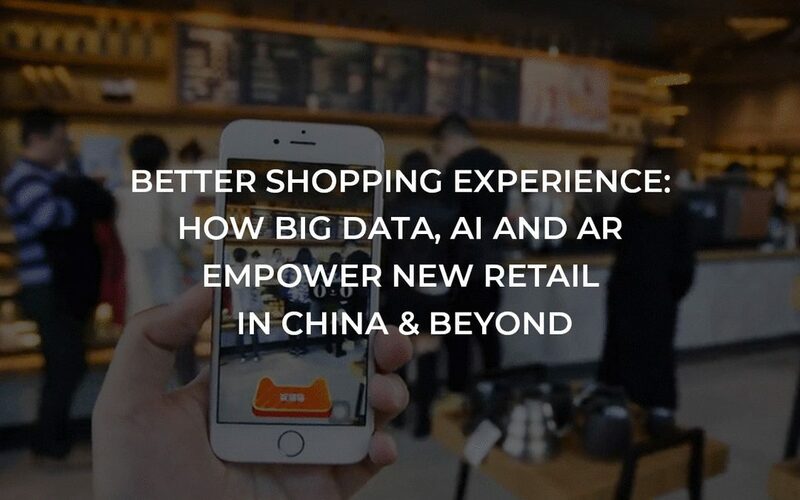 Disclaimer: This article <Better Shopping Experience: How Big Data, AI And AR Empower New Retail in China & Beyond> was originally published in Jumpstart Magazine.